And are willing to fight for it. 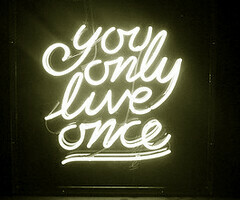 Because you live life only once. So live like you mean it. “I can’t wait to do this again”. very inspiring. just wanted to share my story about moving to Ecuador, hope you enjoy. Reblogged this on A Vantage Point Slightly Lower Than The Usual. There is only one life, and one time, and one place to live, and only one person to live the one life— YOU. Live all your life, waste it not, enjoy to the fullest, so much that when the end comes, you will miss the good life. But (yes, there is s ‘but’) remember to live responsibly for, at the right time, the Supreme Being is gonna want you to account for everything.